Dr. Theodorescu is the Director of Samuel Oschin Comprehensive Cancer Institute at Cedars-Sinai and former Director of the University of Colorado Comprehensive Cancer Center. Working on bladder cancer, Dr. Theodorescu has emerged as a leading translational cancer researcher. His pioneering application of computational biology led to the discovery of genes that regulate tumor growth and metastasis (RhoGDI2, AGL, GON4L) in bladder and other cancers, and novel biomarkers and concepts for precision therapeutic approaches such as the COXEN principle, that are currently being tested in national (SWOG) clinical trials. He also conceptualized the approach and then led the discovery of a “first in class” RalGTPase inhibitor as a new therapeutic in several human cancer types that is currently in commercial development. 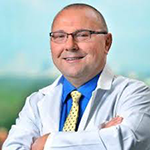 Dr. Theodorescu is both a project leader and co-program leader of an NCI program project and SPORE. He is the recipient of many awards, sits on several boards as has been elected to prestigious societies including the American Society for Clinical Investigation (ASCI), the American Association of Genitourinary Surgeons (AAGUS), the American Surgical Association (ASA) and the National Academy of Medicine (NAM) (formerly Institute of Medicine (IOM) of the National Academy of Sciences). Theodorescu is the founding co-editor of Bladder Cancer, the first journal focused on this disease. From 2010 to 2018, Dr. Theodorescu has been Director of the University of Colorado Comprehensive Cancer Center (UCCC), a statewide consortium encompassing three universities and three academic teaching hospitals. He successfully led the center through two NCI Cancer Center Sup- port Grant (CCSG P30) renewals, the most recent in June 2016 where the NCI review team stated that “Dr. Theodorescu has provided exceptional leadership and exemplary management of the UCCC, positioning the Cancer Center to continue in advancing its national role”. Over the past five years, this national role has been enhanced by election into the National Comprehensive Cancer (NCCN) and Oncology Research Information Exchange (ORIEN) Networks. The UCCC also rose from unranked (2010) to 15th (2015) cancer program in US News and World Report. His experience as a surgeon, in biotech, academic administration and in interactions with elected officials has provided him with insights on how relationships between medical staff , academic, commercial and governmental entities can be crafted to improve local, regional and national health care. Emblematic of this was his work with Reps. Upton (R-MI) and DeGette (D-CO) on H.R. 6, The 21st Century Cures Act that was passed by the House July 2015. He has also been able to secure State of Colorado funding for the Center in 2016. 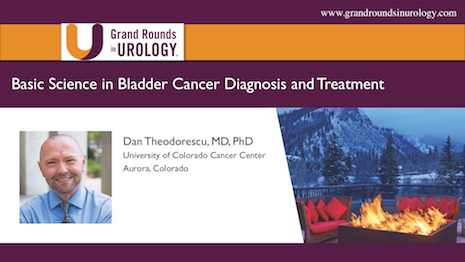 Dan Theodorescu, MD, PhD, describes clinically relevant scientific concepts underlying bladder cancer biology and the technologies, including biomarkers, Polymerase Chain Reaction (PRC), and Western blots, that have enabled the formation of our knowledge today. He then explains how these concepts have and will be used in the clinical management of bladder cancer. Precision Medicine and Advanced Bladder Cancer: Where Are We Today?